DOXA exists to facilitate acts of service to those disadvantaged families in greater Tijuana, Mexico by groups of students and adults who are committed to expanding their understanding of social economic needs and discovering new life by giving themselves away. DOXA engages groups of students and adults to explore the joy of service by investing in the community of greater Tijuana, Mexico. DOXA facilitates trips for groups to build a wider understanding of the world through the construction of homes and service projects for disadvantaged families in Mexico. DOXA’s purpose has become to act as a facilitating agency. This means we work to leverage the resources of churches and other groups, enabling them to easily organize and execute house-building trips in Tijuana. Witnessing the value of these trips in hundreds of lives, we keep finding ways to open this experience of ‘finding life by giving it away’ to more folks. Now we help adult-, men’s, women’s cross-racial, corporate, and of course youth-groups expand their world perspective while getting dirty together on an adventure. DOXA is taking the next steps in realizing that we have built a small town together (more than 1,500 homes, housing more than 5,000 people) and that we have some bigger obligations to the communities we have helped assemble. As DOXA’s roots have taken hold in the community, we began a program to send local children to school. With God’s help, this program has expanded beyond anything we could have hoped. DOXA is now sponsoring 50 children and providing regular after school tutoring by trained Mexican teachers. In the mid-1980’s, a family of 6 living under cardboard or a tarp draped over pallet crates had become an increasingly common sight in Tijuana, Mexico. The population of Tijuana was exploding as people continued to flock to the border city, drawn by the hope of local jobs or crossing into the United States. Tony, who began the orphanage Casa Hogar de los Niños in Tijuana, asked his friend Rod to design a simple-to-build, inexpensive, and durable house. The result was a 12ft x 24ft wood frame house built on a four inch concrete slab that was both affordable and simple enough for someone with no experience to build using only a hammer and saw. The prototype of this house was first built by Rod, his friend Scott, and a team of youth from their Los Angeles based church. 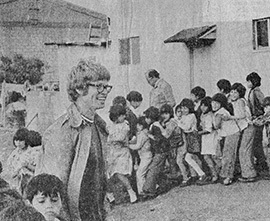 Shortly thereafter, a Seattle youth group approached Tony about staying at Casa Hogar de los Niños during their annual house building Easter mission. Tony welcomed them and suggested trying Rod’s house design. It was such a positive experience that they returned year after year. Soon many other youth and adult house building trips were occurring, all based out of the orphanage. 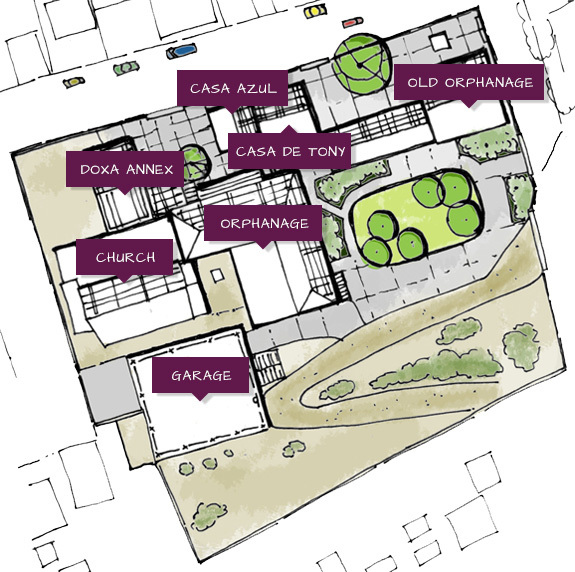 With the Annex in possession, the need to support Casa Hogar de los Niños, organize hundreds of youth/adult groups and to provide an efficient supply of building materials, Homes Without Boundaries (HWB) was formed (1998). Since its inception, HWB has been enabling thousands to build homes with the goal of building over 80 homes annually. As HWB continued to grow so did the vision. In early 2007 the board members realized that we had out grown HWB and it was time to not limit our mission to house-building, but to begin to foster the seeds we had planted in the community by enabling children to go to school and participate in structured after school activities. With this type of expansion HWB was no longer the appropriate name for our organization and we undertook the process of forming DOXA to encompass our mission of serving thru house-building, education, and community. DOXA was officially formed in 2011. DOXA has had the privilege of over a 15 year relationship with Casa Hogar de los Niños. It is the willingness of both organizations to serve one another and the community, which has been a contributing factor to the growth and change seen in the lives of many Mexicans and Americans. The Annex and Orphanage property are jointly connected allowing a relationship to be built between groups, and the staff/children that live at the Orphanage. It is a powerful experience to build these relationships, but it is important to remember that there are cultural differences that need to be respected. As a group, you are a guest in someone else’s country and home. The project coordinator is a great resource for arranging special events for the children or is a great resource for any questions about how groups can respect, help, or contribute to the ministry of the Orphanage.